Results from high-quality, certified Web sites hand-picked by teachers and librarians. Search databases at the same time and find related articles. Learn more about BOW. Catch up on the news about SchoolRooms. Check out the next place you can see SchoolRooms in action and find out more about how SchoolRooms can provide your students with an unparalleled learning experience. Discover how Boston Public Library is using SchoolRooms to create an interactive experience for patrons. From teachers to parents, from high school students to elementary students, SchoolRooms is the "go to" site for K-12. Read the case study on BPL. Designed to meet students' needs and to be a tool for parents who play an integral role in helping their children continue learning outside the classroom. SchoolRooms has been built to encompass the entire U.S. K-12 curriculum, covering 75 major topic areas and includes access to thousands of educator-selected and -certified Web sites. 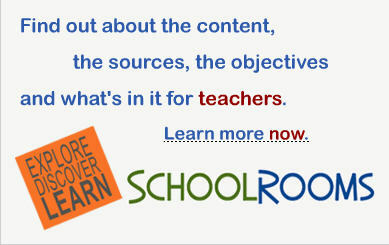 SchoolRooms is a portal to the best content available online.